Wentworth Estate is an area of homes and woodlands extending across more than two and a half square miles in Virginia Water, Surrey, England. Originally a relatively small country estate, it was named for its eighteenth century owner, Mrs. Thomas Wentworth, widow of Col. Thomas Wentworth who fought against Charles Edward Stuart in the Jacobite rising of 1745. The main house was built in 1805 for Culling Charles Smith, who was to become the brother-in- law of the Duke of Wellington. In the early 1850s Ramon Cabrera, the exiled Spanish Count de Morella, acquired the property and in 1854 moved into Wentworth with his English wife. After his death, the Countess de Morella bought most of the adjacent lands to form the present Wentworth Estate. Some of the current road names are reminders of these former owners. In 1912 builder W.G. Tarrant started constructing St George’s Hill in Weybridge, a development based around a golf course that he envisioned as the ideal residence for the wealthy. Here the successful businessman or professional could find privacy, quiet, natural beauty and easy access to excellent sporting and exercise facilities. The success of this venture prompted Tarrant to acquire the development rights for the Wentworth Estate in 1922. As in each of his major developments, Tarrant wished to create an exclusive estate with covenants that ensured that it would be preserved. Unlike St George’s Hill where each property was built on at least an acre of land, Tarrant opted to have at Wentworth houses of a broader range of size and price. The eastern area, near the village of Virginia Water and its rail station, would contain shops and smaller houses. To the west around the golf course, the plots of land and the houses would be larger. The covenants on the deeds forbade the subdivision of plots and the redevelopment of the houses was restricted to ensure that the exclusive nature of the area would continue. For the Wentworth Estate, Tarrant engaged renowned golf architect Harry S. Colt to develop the No. 1 course (now the East Course); he then converted the original Wentworth country house into the Clubhouse. Additional golf courses were later added, including Colt’s championship No 2 course (now the West Course). Following the formula that he used in St George’s Hill and his other projects, Tarrant built large houses with tall chimneys, dormer windows, gables, and leaded lights. The woodwork and joinery of the doors, panelling, beamed ceiling and staircases were always exceptional. Most houses used hand-made bricks or tiles and were tile-hung or half-timbered or a combination of both. Some had stonework around the front door and stone fireplaces; a few included a marble floor in the hall. “Tarrant-built” homes came to be recognised as having an exceptionally high standard of material and workmanship. Development of the Wentworth Estate ground to a halt in the face of the Wall Street crash in October 1929 and the resulting depression. In 1931, Tarrant’s failure to make an interim payment to his lenders triggered a financial crisis, during which the banks holding his on-demand debentures appointed a receiver for his assets and liabilities. These were accumulated into a company called Wentworth Estates Ltd. (the “Company”), which eventually came under the control of Sir Lindsay Parkinson & Co Ltd. The building business was transferred into a newly established company called Tarrant Builders Ltd., where Tarrant’s son Percy became one of the directors. Construction on the Estate resumed in the late 1930s, with many houses built by Tarrant Builders Ltd. By 1939, 359 houses had been completed. 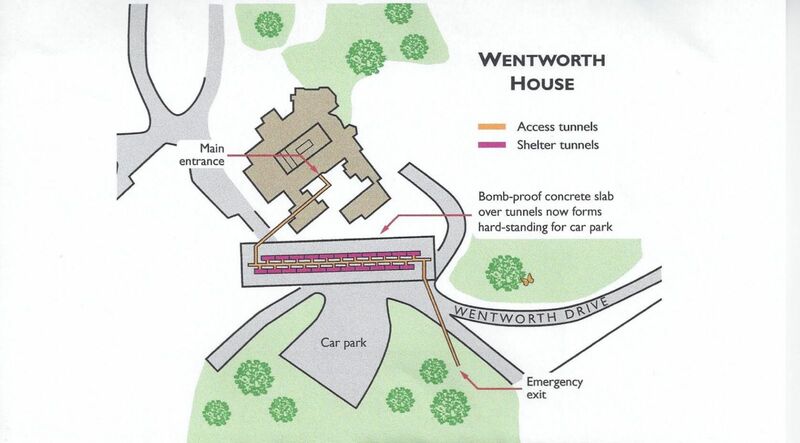 With the outbreak of World War II, Wentworth Estate was selected as an alternative seat of government and a rural command post, offering fewer security problems and more resources than the London Cabinet War Rooms. It is from here that the British government would have operated had it been forced to flee London during the blitzkrieg. Many of the large houses were requisitioned; the golf courses were changed so that enemy planes could not land there; and nearby Virginia Water Lake was drained to prevent its use as a navigation landmark by enemy pilots. A subterranean bunker and tunnel system, now sealed and covered by car parks, was built near the Clubhouse. 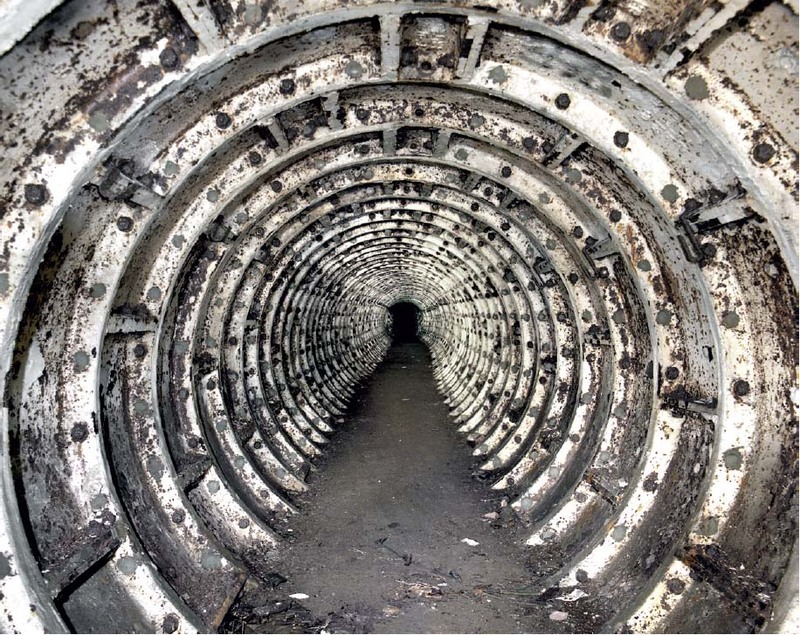 It consisted of two 25-ft diameter parallel tunnels made from cast iron London Underground tube segments with a 12-ft diameter service tunnel running between them. The entire bunker system was covered in a bombproof slab broken by a brick ventilation tower. Access tunnels extended under the Clubhouse and down Wentworth Drive toward the rail station. Wentworth’s top-secret Army camp housed, among others, General Bernard Montgomery’s 21st Army Group, which controlled most of the British, Canadian and American ground forces for the Allies' western invasion of Europe (Operation Overlord). This suggests that many major strategic decisions were made in the Wentworth bunker and surrounding camp. After the war, development on the Estate again picked up and by 1960, most of the available land had been utilised. In 1962 with the majority of the development of the Estate complete, a private act of Parliament was promoted and, following lengthy negotiations, on 31 July 1964 the Wentworth Estate Act 1964 was passed. The Act established the Wentworth Estate Roads Committee to own and maintain the common areas of the Estate and to monitor further development pursuant to Estate covenants, moving the continued oversight of the Estate from the hands of the Company into the hands of local residents. Wentworth Estate covers an area of about 700 hectares (1,750 acres) of gently undulating coniferous heath, a nationally atypical soil type. It rests near the 2,020 hectares of Windsor Great Park. Enclosed in the thirteenth century, this former Norman hunting forest is the only royal park currently managed by the Crown Estate. It includes Virginia Water Lake, first dammed and flooded in 1753 and at that point the largest man-made body of water in the British Isles. Said to be named in honour of Queen Elizabeth I, it was recently used for scenes in the Harry Potter movies. The park also contains the 250-acre landscaped Valley Gardens and the famous Savill Garden, said to be the finest ornamental garden in Britain. Sunningdale, Ascot and Windsor are among the towns surrounding the Wentworth Estate, each adding to the local history, culture and ambiance. Wentworth Estate continues to be one of Europe’s premier residential areas, with homes in styles ranging from the ornate multi-chimney Arts and Crafts style of the early properties, through Neo-Georgian and colonial revival, to the post-modernist style seen in the recording studio at John Lennon’s nearby Tittenhurst Park. The golf courses originally serving as the lynchpin of the Wentworth Estate development now extend to three 18-hole courses and one 9-hole course, all owned by Wentworth Club. In 1926 the Club was the site of the informal challenge match between Britain and America, witnessed by Samuel Ryder, which encouraged him to set up the gold cup and biennial competition now known as the Ryder Cup. During its history the Wentworth Club championship course has been updated by golfing greats such as Ernie Els and currently hosts the annual BMW PGA Championship. Wentworth’s contributions to history extend well beyond its golf courses and hush-hush Second World War army base. Other notable moments included serving as the site of the house arrest for former Chilean president General Augusto Pinochet, prior to his extradition in 1998. In more recent times the Estate has been home to a host of famous athletes, musicians, actors and entertainers, financial figures and royalty. More importantly, it is currently home to a diverse range of individuals and families, drawn to its quiet green belt environment, its beautiful residences and its curving tree lined roads. A more in-depth history of W.G. 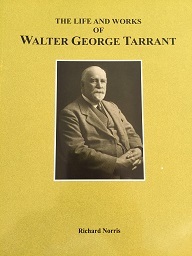 Tarrant and the Wentworth Estate may be found in Richard Norris’s The Life and Works of Walter George Tarrant. 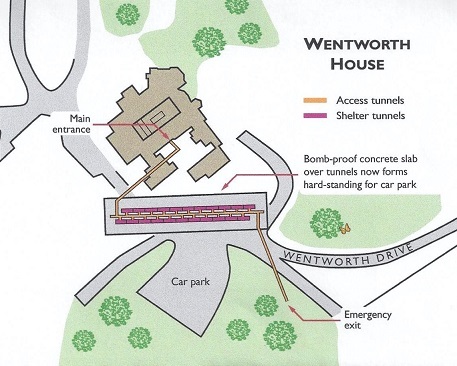 The Wentworth Estate Roads Committee also wishes to thank the members of Subterranea Britannica for the use of the images and plan of the Wentworth bunker. Particular thanks are extended to Roger Morgan, who holds the copyright for these images. Further information relating to the bunker may be found on Subterranea Britannica's fascinating website www.subbrit.org.uk.